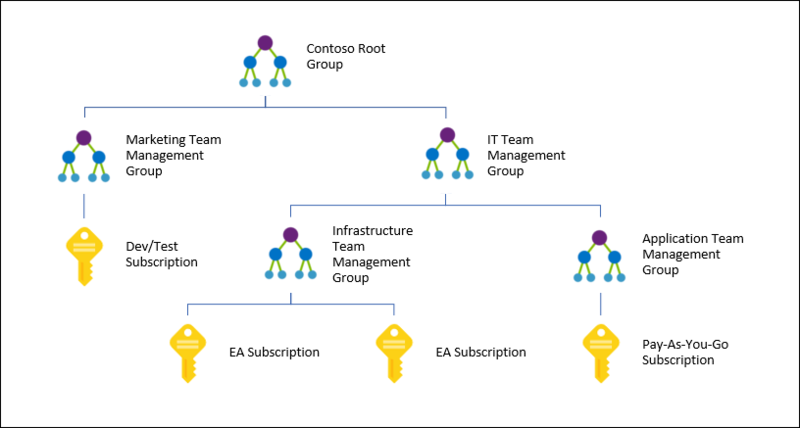 Microsoft has created a new administrative model for organisations that have many Azure subscriptions called Management Groups. 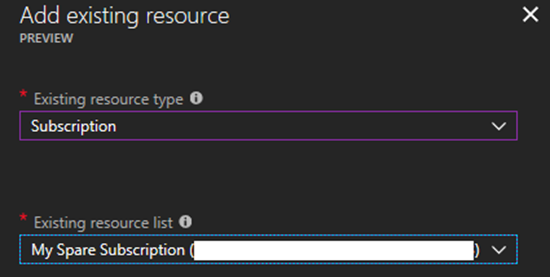 With this feature, you can delegate permissions and deploy Azure Policy (governance) to lots of subscriptions at once. The contents of this post are currently in preview and will definitely change at some point. Think of this post as a means of understanding the concepts rather than being a dummy’s guide to mouse clicking. Also, there are problems with the preview release at the time of writing – please read Microsoft’s original article before trying this out. Note: Microsoft partners working with lots of customers, each in their own tenant, won’t find this feature useful. But larger organisations with many subscriptions will. 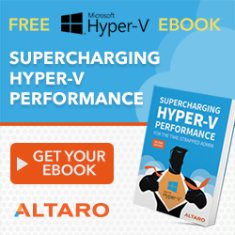 Can contain up to 10,000 subscriptions in a single tenant. 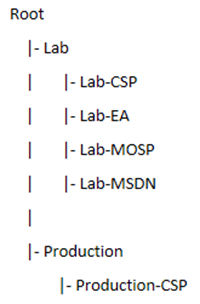 It can span EA, CSP, MOSP, etc, as long as the subscriptions are attached to a single tenant. There can be up to 6 levels of groups, not including the root (tenant) and the subscription. A management group can have a single parent, but a parent can have many children. 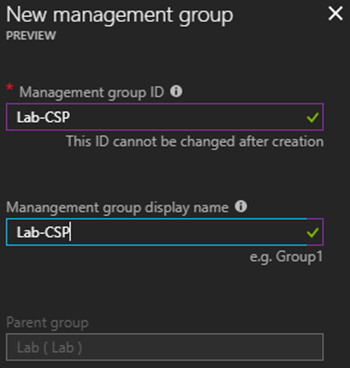 Now you have what it takes to configure management groups. 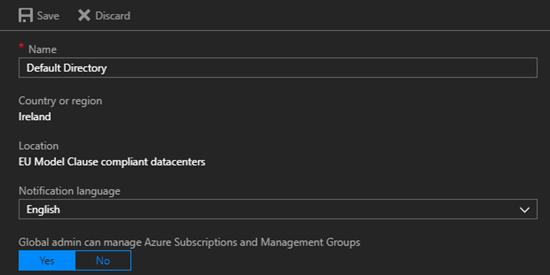 Allegedly today we can use Azure CLI or PowerShell to create/configure management groups, but I have not been able to from my PC (updated today) or from Azure Cloud Shell. However, the Azure Portal can be used. You’ll find Management Groups under All Services. Creating a management group is easy; simply click New Management Group and give the new group a unique ID and name. I can repeat this as required to build up a hierarchy that matches my/your required administration delegation/policy model. How I’ve done it here isn’t probably how you’d do it. In the old model, before management groups, permissions to subscriptions were created at the subscription level, leading to lots of repetitive work for large organisations with lots of subscriptions. With management groups we can do this work once in the management group hierarchy, and then add subscriptions to the correct locations to pick up the delegations. Universal permissions should be assigned at the top level management group(s). 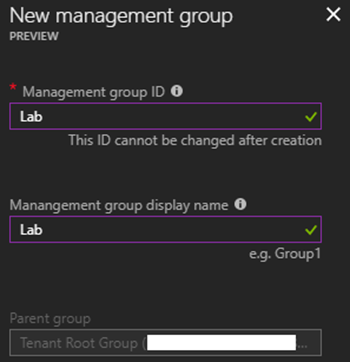 For example, if I click Access Control (IAM) in the settings of the root management group, I can grant permissions to the root management group and, thanks to inheritance, I have implicitly granted permissions to all Azure subscriptions in my hierarchy. So a central Azure admin team would be granted rights at the default root management group, a division admin might be granted rights on a mid-level management group, and a dev might be given rights at a bottom-level management group. Once you are in Details (settings) for a management group, click on Access Control (IAM) and you can grant permissions here. The users/groups are pulled from your Azure AD (tenant). As usual, users should be added to groups, and permissions should be assigned to well-named groups – I like the format of <management group name>-<role> for the group names. 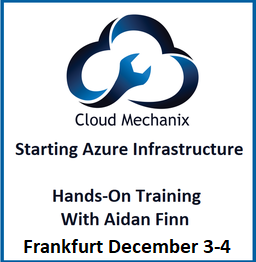 You can create a new Azure Policy and save it to a management group. Microsoft recommends that custom policy definitions are saved at a level higher than what you intend to assign it. The safe approach might be to save your custom policy definitions and initiative definitions at the root management group, and then assign them wherever they are required. Note that, just like permissions, any assigned initiative (recommended for easier ownership) or policy (not recommended due to ownership scaling issues) will be inherited. 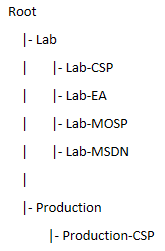 So if my organization requires Security Center to be enabled and OMS agents to be deployed for every VM, I can create a single initiative, stored at the root management group, and assign it to the root management group, and every VM in every subscription in the management group hierarchy will pick up this set of policies. Right now, we have a hierarchy but it’s useless because it does not contain any subscriptions. THE SUBSCRIPTIONS MUST COME FROM THE CURRENT TENANT. Be careful before you do this! The delegated permissions and policies of the hierarchy will be applied to your subscriptions, and this might break existing deployments, administrative models, or governance policies. Be sure to build this stuff up in the management group hierarchy first. To add a subscription, browse to & open the management group that the subscription will be a part of – a subscription can only be in a single management group, but it will inherit from parent management groups. The subscription will be registered in the management group hierarchy. You’re a Microsoft partner looking for a delegation model with customer’s tenants/subscriptions because it just cannot be done. You have only a single subscription – just do your work at the subscription level unless you want to scale to lots of subscriptions later. If you have a complex organisation with lots of subscriptions in a single tenant, then management groups will be of huge value for setting up your RBAC model and Azure Policy governance at the organisational and subscription levels.